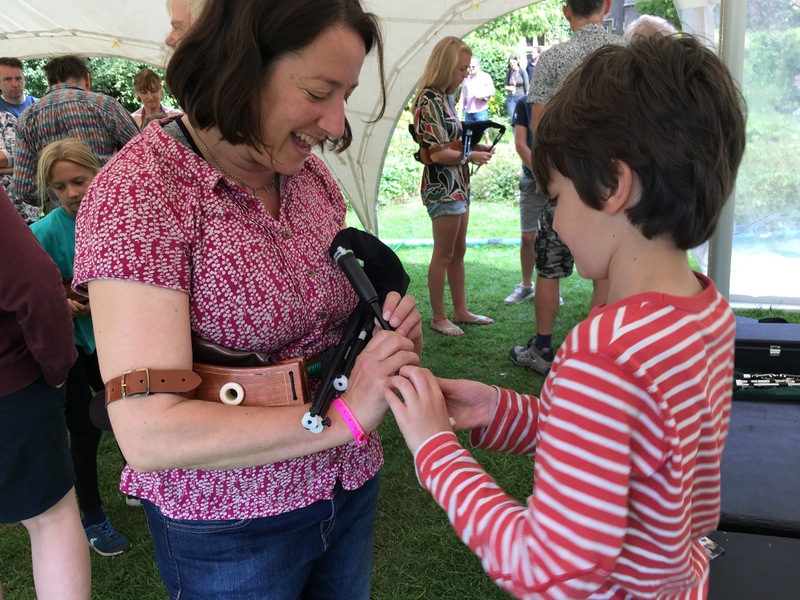 From 2011, we’ve been running Northumbrian small pipes workshops at the Cambridge Folk Festival, using the School Pipes designed by Mike Nelson (maker of Kathryn Tickell’s pipes) to give people a first taste of playing the instrument. We run two workshops in the Flower Garden, regularly attended by around 80 people. 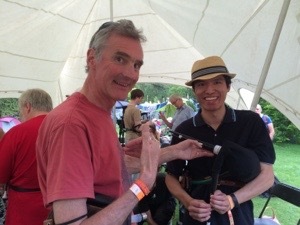 To hear what the pipes sound like, listen to Edric Ellis, one of our regular tutors. We’re proud of his triumphs in recent years in the Open competitions at Rothbury, Morpeth and the Northumbrian Pipers’ Society. We’re enjoying the 2018 workshops. 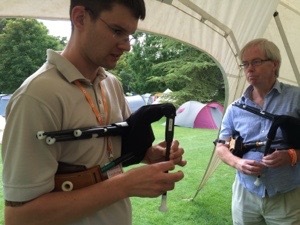 As in previous years, we had practice pipes for those who wanted to try their hand. First pics below! Thanks for coming! More on Sunday at 11.30! Check out pics and vids from previous workshops below. We had a great time! 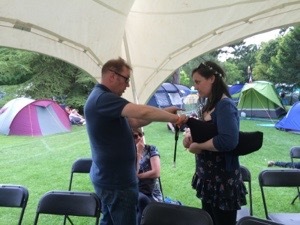 We began on the Friday by busking outside the concessions tent, to drum up a bit of interest, which seemed to intrigue a few Festival-goers. On the Saturday and Sunday we ran our two workshops with around 50 people at each. We had some faithful returners from previous years, including one who’s since taken up the pipes, first hiring a set, then buying his own. Here’s Nick demonstrating the pipes. And Edric playing The Highland Laddie and Shields Fair. Then we demonstrated the school pipes, before inviting workshoppers to try them for themselves. And here he is teaching his mum! Edric with his first pupils! After the Saturday workshop we played a session in the Sessions Cafe, appropriately enough! 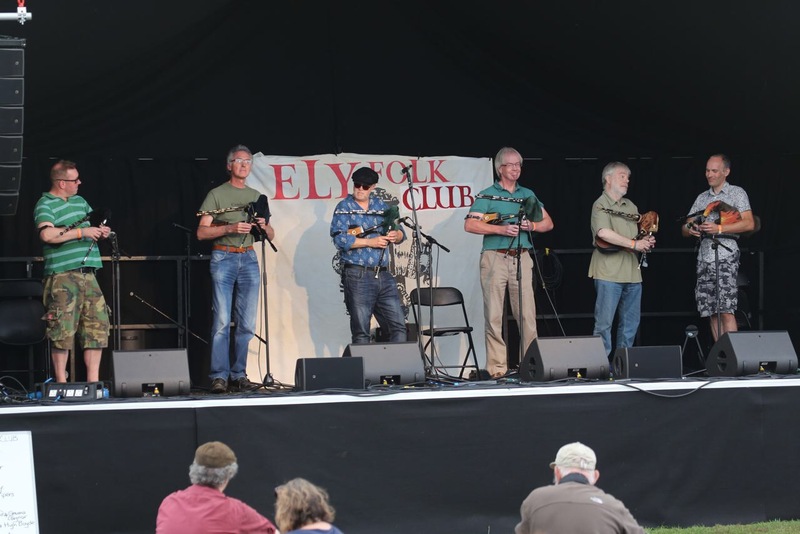 And we had a new experience this year: a slot at the Club Tent as guests of Ely Folk Club. Here we are playing Rothbury Hills and Joe Hutton’s March. 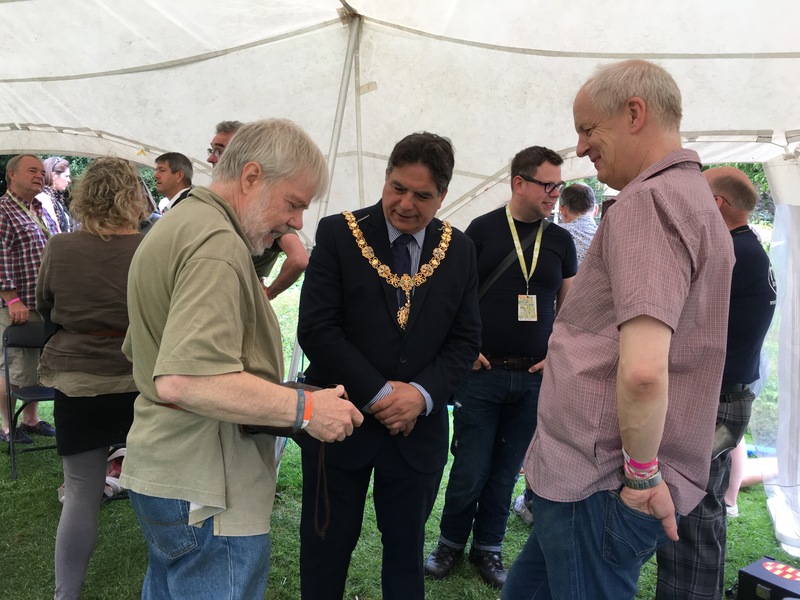 The BBC recorded it, and you can just hear us under the intro to Mark Radcliffe’s Radio 2 programme on the Cambridge Folk Festival. And here we are with Swindon and Wade Hampton’s hornpipe! And finally, with Air Moving, by Kathryn Tickell, followed by Because he was a Bonny Lad, and Holmes’ Fancy. We look forward to next year, to seeing new faces and old friends, and another chance to explore our endlessly fascinating instrument and its musical tradition. See you there! Our workshops took place on Saturday and Sunday, with the usual healthy attendance: about 80 at each workshop. 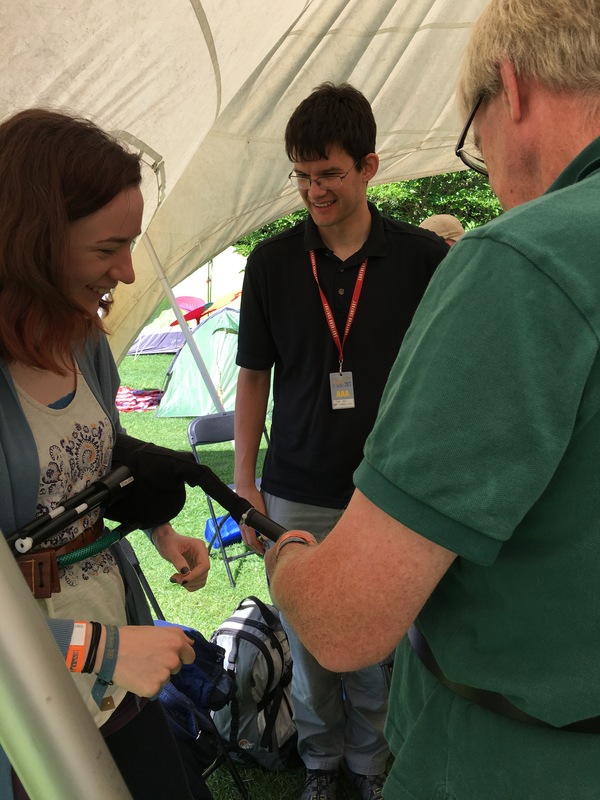 We enjoyed meeting new festival-goers interested in finding out more about this beautiful instrument, and trying it for themselves – and catching up with old friends from previous years. Here’s one young participant in full flow on the practice pipes. And Alan coaching another youngster. And here’s Edric teaching another workshopper! And one of our regulars, Lucy, back for the third year! 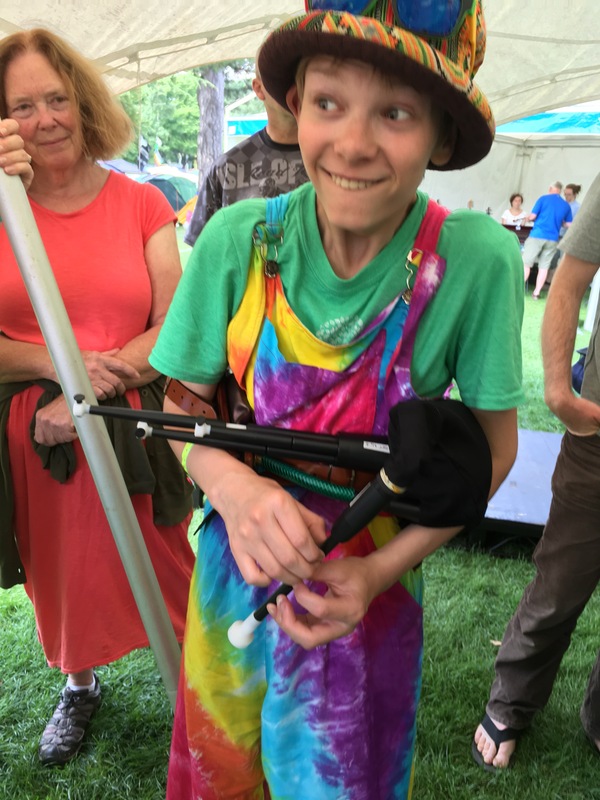 And here’s a video of Nick playing The Wild Hills of Wannies to demonstrate the emotional range of the pipes! 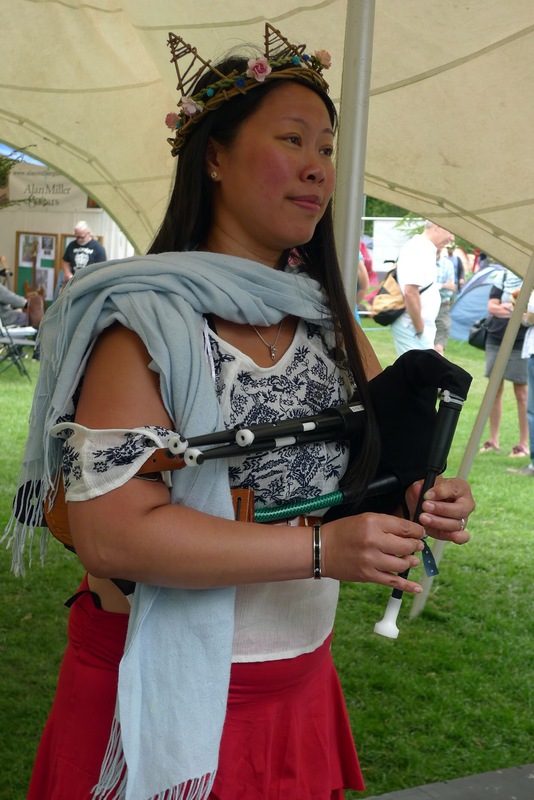 The first workshop went brilliantly – 73 people, many of whom tried their hand on the pipes. Many achieved a good scale of G! Some managed Frere Jacques! 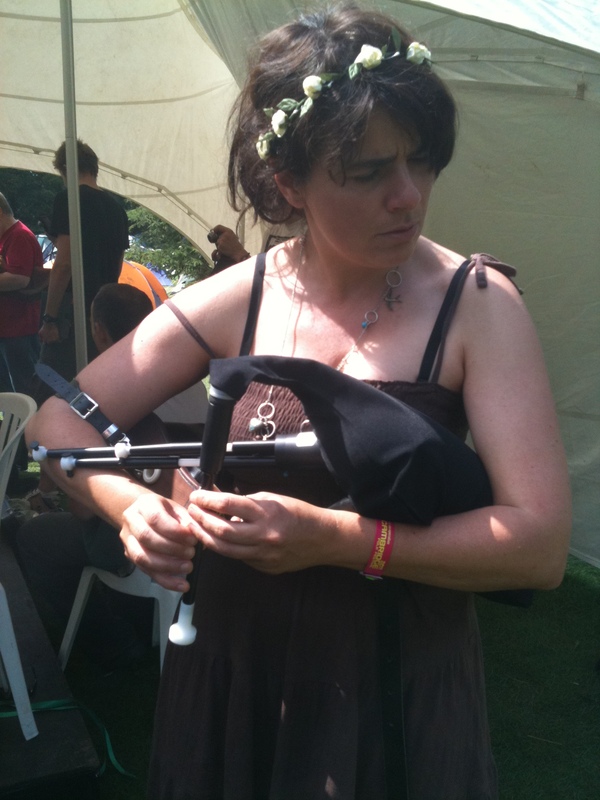 One spontaneously played the Lord of the Rings theme tune!! Here’s Edric playing his demonstration set. The second workshop went just as well, with some people coming back for more! Our champion player from last year, Lucy, returned to play a duet with David. And our new star, who played Lord of the Rings yesterday, moved on to the traditional Northumbrian tune Buttered Peas! Here she is working with Alan. And here’s David working with Rob, another faithful returner from last year, now holding a steady tune! Respect! As always, we were impressed by everyone who had a go, managed steady notes, scales, and generally got a feel of this beautiful instrument. Well done to all! Here’s Nick teaching a cheerful workshopper! 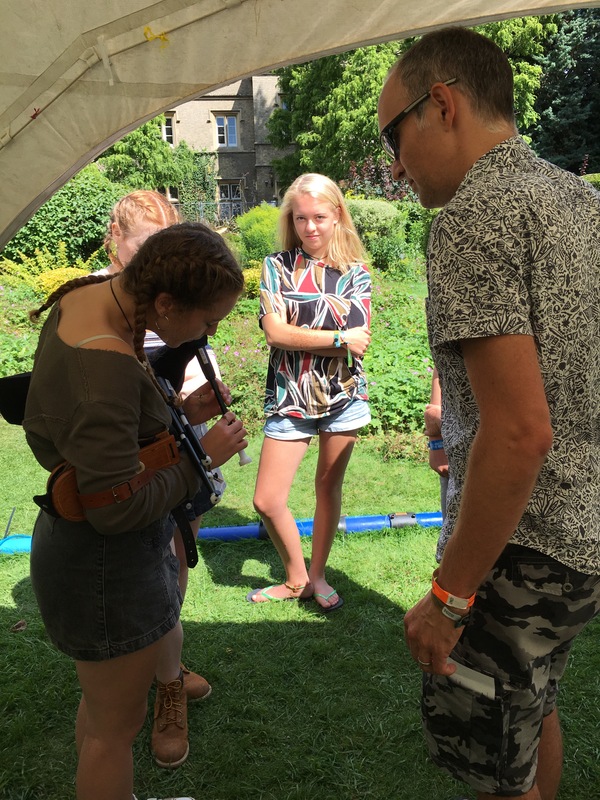 We had a great time at the 50th anniversary festival, with workshops in the Hub and the Flower Garden. 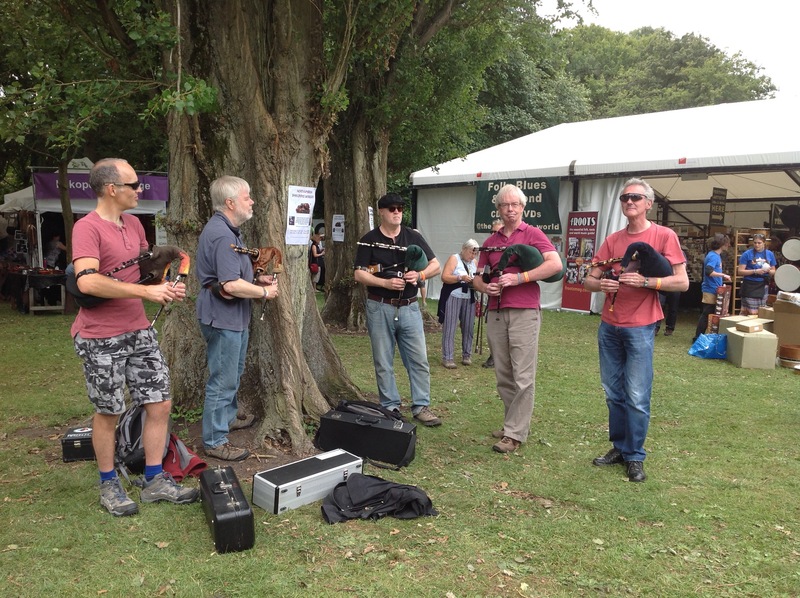 We had guest piper Nick Leeming from Northumberland, Edric Ellis from the Cambridge chapter of the Northumbrian Pipers’ Society, and the Great Eastern Ceilidh Company: David Somerville, Mike Nelson, Andrew Burn, Greg Smith – and Hazel on hammered dulcimer. 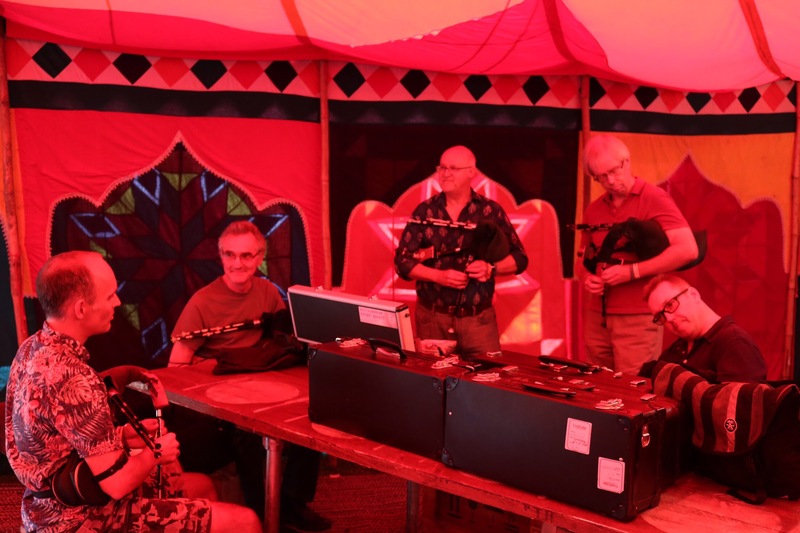 The first two workshops were a big success, with about 50 people trying the pipes for the first time, many of them managing to play drones, a few notes, and even whole tunes in a couple of cases after only 20 minutes of tuition. Some participants also chose to try their hand at the hammered dulcimer. 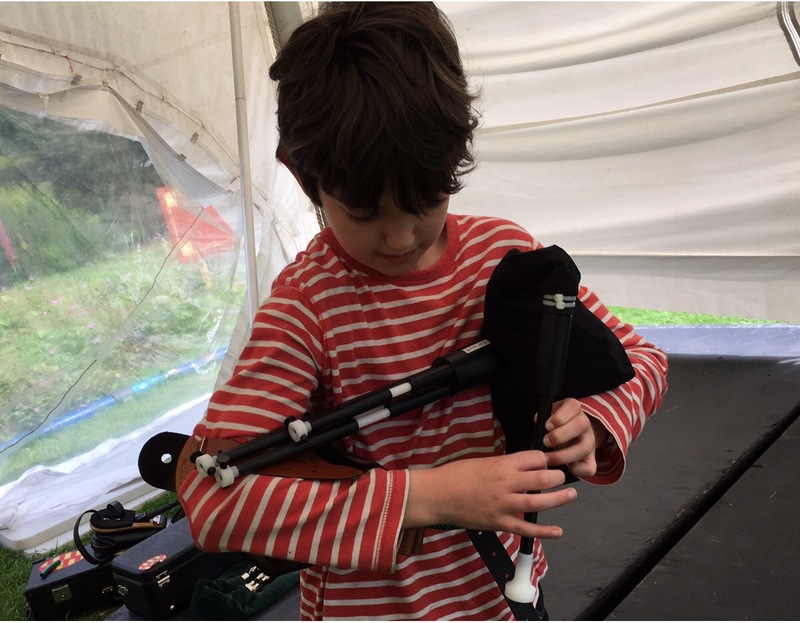 Here’s a young participant from the Friday workshop who achieved a full scale of G within 10 minutes of strapping on the pipes. 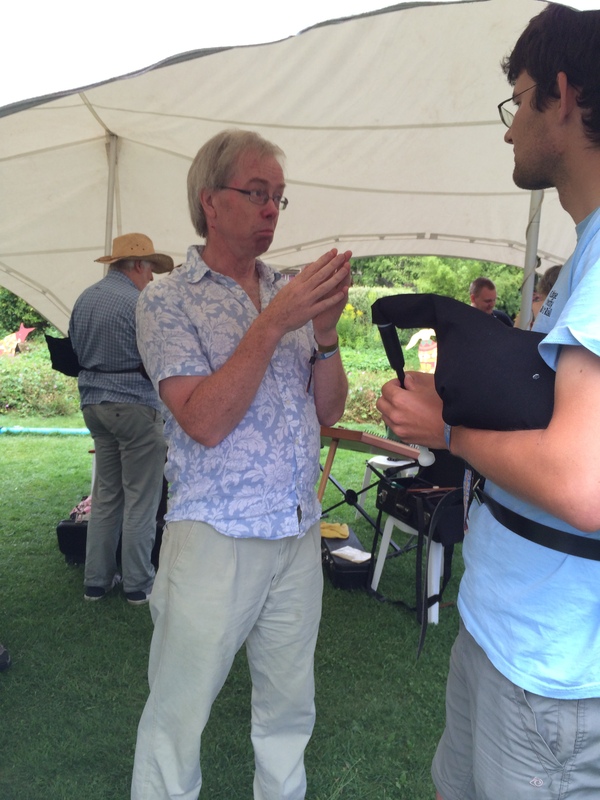 And here’s Nick Leeming working with another promising pupil with a stunningly constant drone! We were knocked out by one participant, Lucy, who managed to play the whole of Oh Susanna after only twenty minutes tuition. Here’s a video of it, with her permission – to show what’s possible on the school pipes in a very short time! 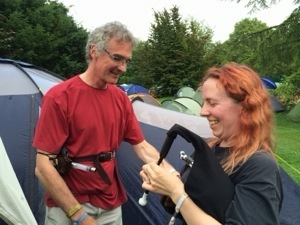 And here she is with Mike, discussing how to develop her interest in the pipes beyond the workshop – our ultimate ambition! The young people’s workshop in The Hub also went well. It was less well-attended, but sisters Grace and Molly made fantastic progress, playing Frère Jacques in canon after twenty minutes’ tuition. To give a flavour of the tutors’ demonstration performances, here are two videos. First, here’s Nick playing Scott Skinner’s ‘Hector the Hero’ as a demonstration in one of the workshop sessions. And here’s a video of Edric playing Scott Skinner’s ‘The Bonny Lass of Bon Accord’ in another of the adult workshops. 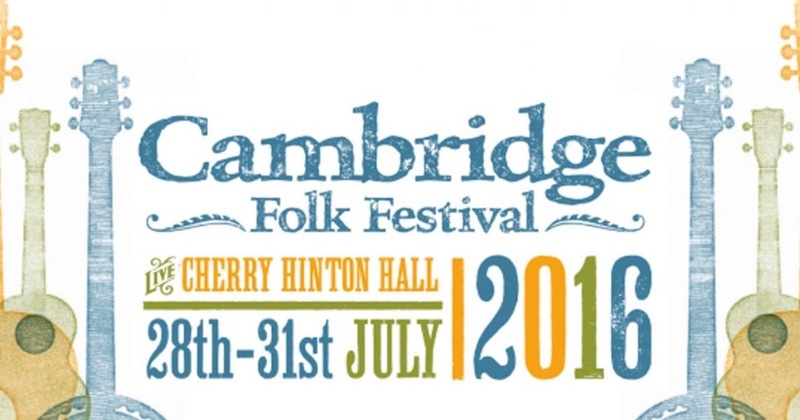 We hope to be back at Cambridge next year with more workshops. 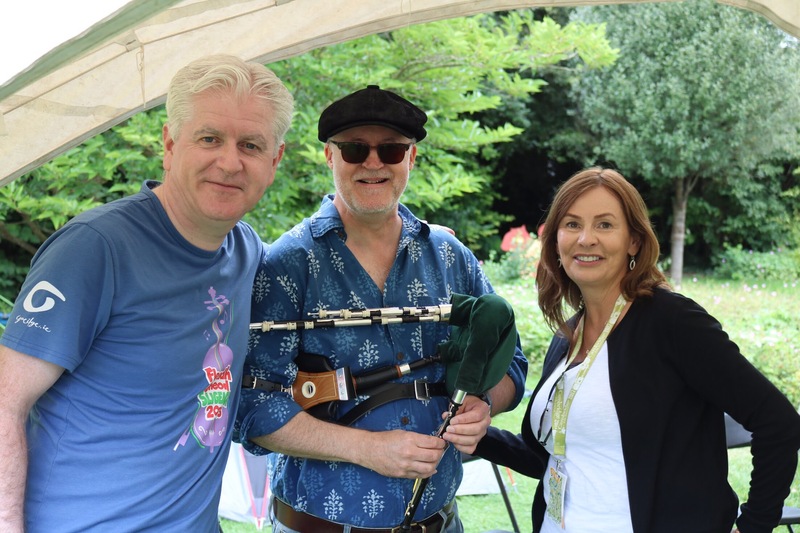 If you’re coming to the festival, look out for The Six Pipers! There’s more below on workshops in previous years. 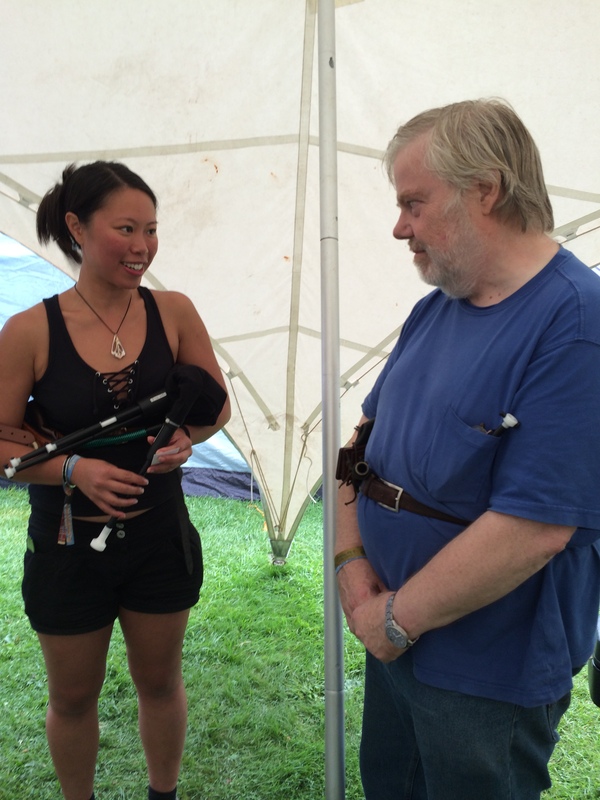 In the first year, we were very pleased that our proposal for a workshop based on the Northumbrian smallpipes was enthusiastically received by the Festival organiser Eddie Barcan, who has continued to welcome and support us. 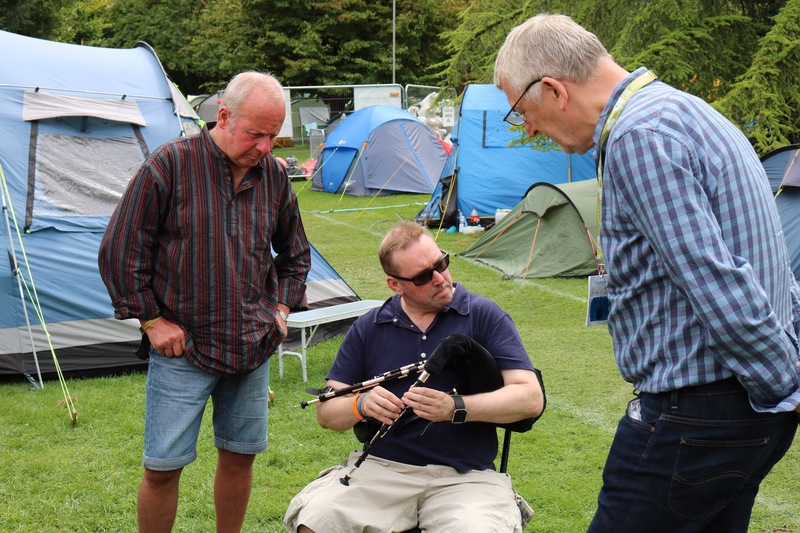 Andrew, Mike and Francis Wood from the London piping group ran the event. 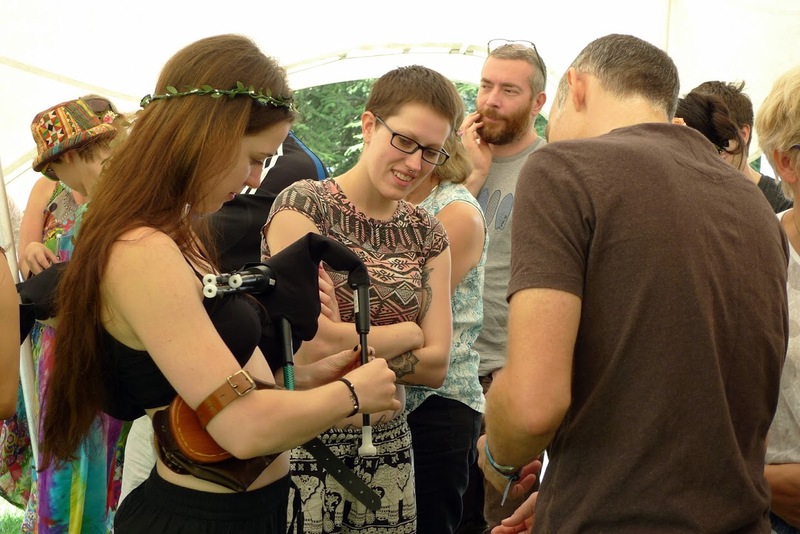 This established the pattern for subsequent years, attracting around 80 people to each of the two workshops in the Flower Garden, and around twenty young people to the workshop in The Hub. In 2012, we expanded to cope with demand (200 people turned up to the workshops in the first year). So Mike, David and Andrew were joined by Anthony and Heather Robb, and we attracted the same kind of numbers. 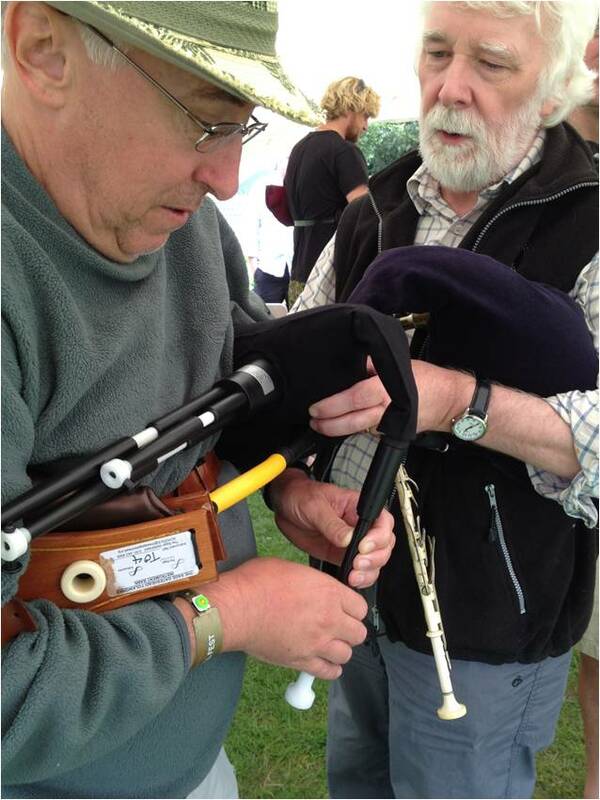 Anthony was a great piping guru, lending his vast experience and skill, and demonstrating, tutoring and expounding with characteristic humour. 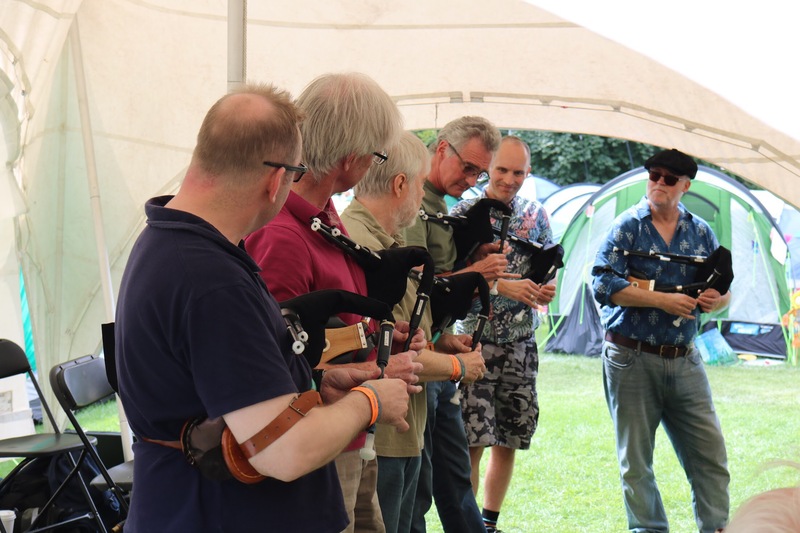 At the 2013 festival, under the name The Six Pipers, we were joined by Edric Ellis from the Cambridge pipers’ group, and Richard Cooper and Nick Leeming from Northumberland. 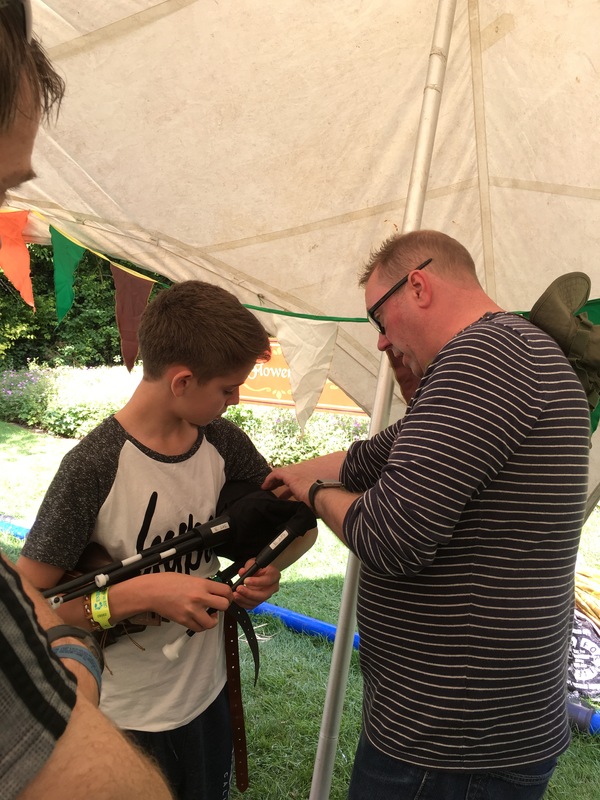 As in previous years, about two hundred people in all attended the workshops, about half of them having a go on the school pipes. 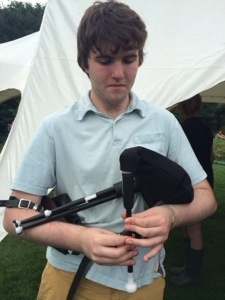 The video below shows Richard demonstrating the pipes by playing The Marquis of Waterford and Banks hornpipe.